Local Coffee roaster and café set up in a hip and vibrant area just on the periphery of downtown Victoria. With close to 1400 sq ft of wide open industrial style space and soaring 30 foot timber ceilings and great natural light from the skylights. 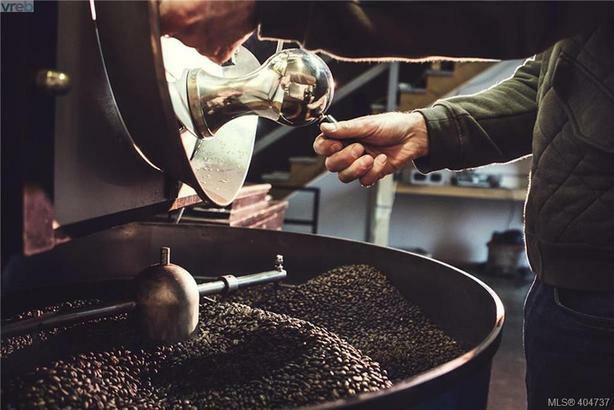 This roaster is fully turn key and set up with a 12kg custom Drum roaster that runs on natural gas as well as having a fully custom 180 liter 4 stage filtration Cold Brew coffee unit. In addition to the wholesale business this space has a fully equipped 40 seater café selling specialty coffee, house made wraps/sandwiches, soups, locally sourced baked goods and a small retail coffee section. A great long term lease is in place with the ability to scale the wholesale operation and build upon the already strong daily café trade.